Did Kerala CM Elect Say - Kill RSS Men Bengali Style? Did Kerala CM Elect Say – Kill RSS Men Bengali Style… Shocking? 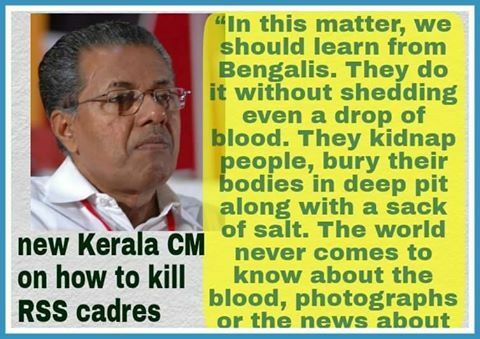 Pinarayi Vijayan, the soon to be CM of Kerala had asked his cadres to carry our “Bengali Style killings” of RSS men. This was in response to massive exposure to CPM’s killing of RSS men in Kerala. So what is this Bengali style killings? Pinarayi Vijayan’s had described this to, “let us learn from Bengalis. They do it without shedding even a drop of blood. They kidnap people, bury their bodies in deep pit along with a sack of salt. The world never comes to know about the blood, photographs or the news about such killings.” Sadly, in light of brutal killings and terror in recent years, people are starting to refer to Kerala from God’s own country to much different “Terror’s own country”.